Levitan is known to everyone as the most famous Russian landscape painter. In this picture, we see an image not quite familiar to him – a still life. Nothing distracts the viewer from the spot of meaning: the artist has not created a single detail around a vase with flowers, for which the viewer could catch the eye. All attention is paid to flowers: divinely beautiful cornflowers in their simplicity. Simple wildflowers amaze with their magnificence. It would seem that ordinary cornflowers, the same, similar to each other. But each of this small bouquet of cornflower flower attracts separate attention. Each of them has its own special color. Here the viewer will find bright blue cornflowers, and with a slight shade of purple, and dove, and pink, and even white cornflowers. All flowers of different lengths: it seems that the bouquet was collected in a hurry, without special attention. Together with cornflowers in a bouquet, a pair of ears of wheat was packed – it is unlikely that they were standing in a vase on purpose, most likely they were caught while carelessly picking a bouquet. But it is precisely in this negligence that a special charm is hidden. There is no obsession or pathos in the bouquet – simple flowers please the eye, I do not pretend to a special title. Cornflowers are in the usual clay pot of a greenish hue. It is not fitting for such colors to select special vases – they began to play even brighter against the background of a simple pot, they became even bluer or more white. It seems that all shades of blue and blue are gathered in this particular bouquet, and the second one can never be collected. Down on the table, covered with a light, unremarkable tablecloth, there are already a couple of petals – well, the century of cornflowers is short, very soon they will all crumble. The tablecloth merges with the wall – there is no separation between them. 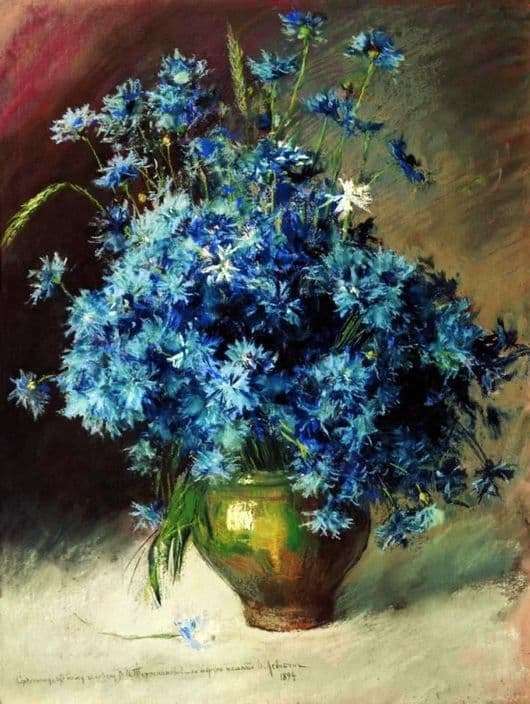 There is a feeling that the pot of flowers just hung in the air – this is how the artist captured his fleeting beauty.